Presenting the KittyCatS Haunted Collection 2018: Devil Dolls 2 - hOt anGeLS! Devil Dolls 2 - hOt anGeLS! KittyCatS! KittyCatS is proud to present our 2018 Haunted Collection: Devil Dolls 2 - hOt anGeLS! collectible KittyCatS! It's time for another spooky sequel! Last year you all begged for a Devil Doll sequel after seeing the Hell-O-Kitty sequel, so the cats reminded us this year to make SURE they could make another "appearance" and haunt you again with their charm! Devilishly cute, these tantalizing teases are just purrring with excitement at making you laugh, scream, and shriek with delight all over again! We hope you enjoy these little "angels" all year long! Be good, be Devlish, but ONLY in a kind way! 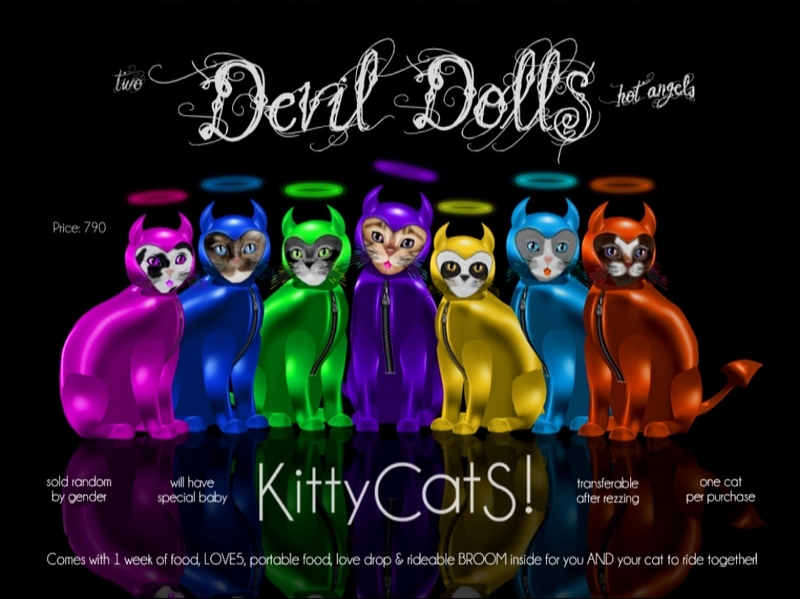 KittyCatS - Devil Dolls 2 - hOt anGeLS! Facts! * are the KittyCatS Devil Dolls 2 - hOt anGeLS! cats transferable? - yes, after you rez them! * do they pass on their coats/eyes/tails/ears? -the Devil Dolls 2 - hOt anGeLS! are a specially designed collectible cat with random Genesis KittyCat traits which have the potential to pass their hidden traits like any other Genesis KittyCat. They can carry the genes of the new traits and furs that can only be discovered through breeding. * can they breed something special? – yes! If you breed two Devil Dolls 2 - hOt anGeLS! kitties they will give you a really lovely special baby you will NOT want to miss! RE: Presenting the KittyCatS Haunted Collection 2018: Devil Dolls 2 - hOt anGeLS!